Recently, the AFL-CIO launched another tool to bring you the issues and stories that matter to working people. 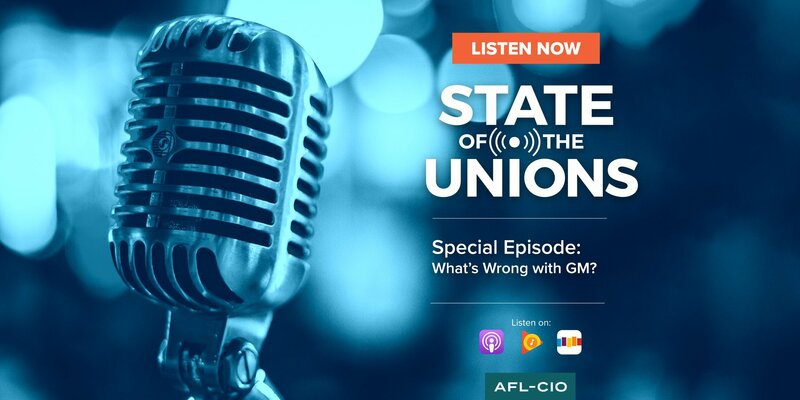 In the latest episode of our podcast, “State of the Unions,” we talk to longtime UAW member and AFL-CIO Industrial Union Council Executive Director Brad Markell about General Motors’ recent decision to close five North American plants, costing up to 14,000 workers their jobs. “State of the Unions” captures the stories of workers across the country. It’s hosted by two young and diverse members of the AFL-CIO team: Mobilization Director Julie Greene and Executive Speechwriter Tim Schlittner. A new episode will drop every other Wednesday featuring interesting interviews with workers and our allies across the country, as well as compelling insights from the podcast’s hosts. “State of the Unions” is available on iTunes, Google Play Music, Spotify, Stitcher and anywhere else you can find podcasts.